“Dear Mr Potter, We are pleased to inform you that you have a place at Hogwarts School of Wizardry and Witchcraft …Term begins on 1 September. We await your owl by no later than 31 July.” Those words, published 10 years ago, unleashed the power of the young magician Harry Potter. And this year, on Saturday, July 21, at 9am, the Potter journey will come to an end with the simultaneous worldwide publication of Harry Potter and the Deathly Hallows, the seventh and last volume in JK Rowling’s series. Will Harry die? Will Voldemort die? Will Dumbledore return from the dead? Will there be room for sequels? How can JK do this to us? Why can’t she just keep writing forever? Rumours of the publication date have been hovering around magicspace for months; fans have trawled websites looking for clues. But one Canberra student waited with more anticipation than others. 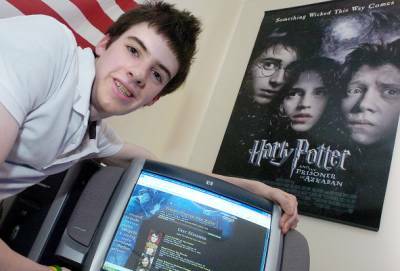 Andy McCray, 17, of Theodore, is the founder and publisher of the Harry Potter Fan Zone. He’d just about given up on the hope of publication this year until reading a press statement late on Thursday night. His Fan Zone is not the leading Harry Potter site in the multiverse. That title probably belongs to Mugglenet or The Leaky Cauldron. But it has enough power and influence, 20,000 hits a day and 100,000 on a big news day; to warrant publishers giving Andy, a student at St Edmund’s College, a heads-up come publication time. And Warner Bros, the makers of the Harry Potter film sequence, also acknowledge the clout of Andy and his fanzine. With the release of the fifth film, HP and the Order of the Phoenix, Andy will be flown to New York for the premiere. It is his second time conducting interviews on the red carpet. Warner Bros flew him to New York in 2005 as well. He was just 16 and even squeezed in a quick one with Daniel Radcliffe, who plays Potter. Andy is modest about his achievements. His father, a public servant, brought home a copy of the latest Harry Potter from England in 1999. It was a hit with Andy and his brother Mark, now 15. Andy, an IT addict, quickly began to think of ways he could combine his enthusiasm for Potter with his passion for technology and the Harry Potter Fan Zone was born. Eight years later, he works collaboratively with nearly 30 others all over the world to ensure the news is up to date and the graphics grab attention. The first time he met his collaborators was at the film premiere in 2005 and hopes to catch up with them again this year. “At heart, I still like reading the books but as I have grown older, I look at the books from a different perspective. “It used to be about magic and adventure but now I see it as a more complex and mature story,” he said. Harry and Andy are about the same age; and are looking to their future. We don’t know what awaits Harry (and pray it isn’t a life in a dingy department somewhere fending off practitioners of the Dark Arts). Andy is pretty keen on continuing his IT adventures which are already netting the website close to [omitted] a year. The ACT libraries were busy yesterday with 37 people putting in their requests to read the latest volume. Libraries will only take reserves when the day of publication is known. And the bookshops have been busy too. Both Paperchain at Manuka and Dalton’s in Civic took their first orders yesterday all from adults. The recommended retail price will be $49.95. First published in the Canberra Times, 3 February 2007.